Syros, Greece, or Seros, Greece, as the island is also known, is the administrative island of the Cyclades. The main town on this island, Ermoupoli, is the capital for the entire island chain, and here many of the Cyclades administrative buildings reside, where issues specific to the Cycladic Islands are addressed. Ermoupoli is the main harbor on the island, and due to the geographic location of the island, the islanders have made their mark in sea faring for centuries. 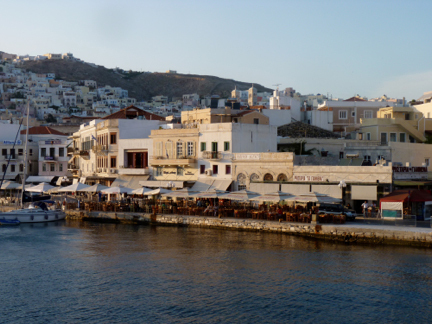 Syros is an island of two religions, with both the Roman Catholic and Greek Orthodox religions showing a strong presence. Syros is also a bastion of religious tolerance. Cruising into the busy main harbor of Ermoupoli on a crewed yacht charter, look up into the hillsides to see the two large churches on mirror hilltops side by side, one church Roman Catholic and the other church Greek Orthodox. The island had a unique religious history, and was, during the Venetian Period, virtually totally Roman Catholic. During the Ottoman Occupation, Catholicism was allowed to continue under the protection of France and Rome and the island was known as “The Pope’s Island”. Due to the religious tolerance and other cultural tolerances for which the island was known, Syros became a haven for many Greeks during the Greek Revolution in 1821, which brought those who were Greek Orthodox to the island. 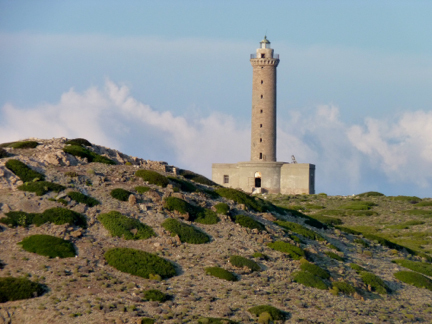 Today, the islanders are about one half Roman Catholic and one-half Greek Orthodox and live amicably side by side with much intermarriage between the two religions. Presence of the two religions is hard to miss when cruising into the main harbor of Ermoupoli with the large Catholic cathedral on the left perched on a hilltop and the large Greek Orthodox church on the right perched on a hilltop, both overlooking the harbor. 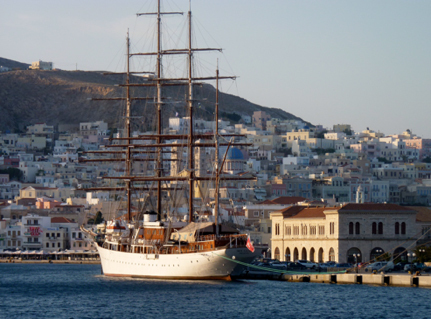 In more modern history, in the 1800’s, Syros was very prosperous due to trading given that the island is located along important seafaring routes. Many of the young men from the island headed off to sea. The island was home to many sea captains who sent their funds back to the island for civic improvements such as new buildings, monuments, churches, and roads. Prosperous sea captains from Syros also built great mansions, many along the island coast with back stairs leading directly into the water for ready access by ship’s tender to their ship. The height of maritime prosperity for the island, in the 1800’s, was when the neoclassic style of architecture was in vogue. The northern part of the island is more mountainous, with fewer roads, and a wilder feel. Here are caves, cliffs, and beaches that few visit. The southern side of the island is more developed with all roads connecting through Ermoupoli and with beaches with a more resort feel. Ermoupoli: Cruise into Ermoupoli today to see ringing the harbor, this investment that native sons made in their hometown including paved marble streets, large captain’s mansions and civic buildings. 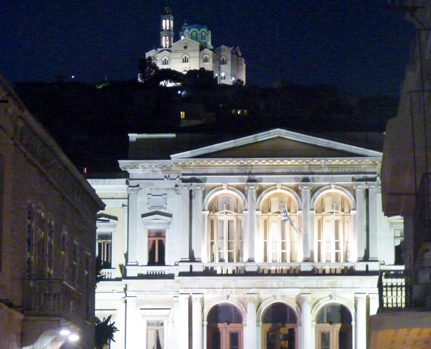 The most important building from this time is the Town Hall built in the neoclassic style and set back in a large paved piazza encompassing almost a full city block. In the 1800’s, until around 1860, Ermoupoli was the largest and most prosperous ship harbor in Greece, outshining even Piraeus on the mainland. Visit the Industrial Museum of Ermoupoli, located in a restored factory, with exhibits chronicling Syros’ industrial and shipbuilding traditions at the height of the island’s wealth. This is a great location to stroll the streets, perhaps enjoying a cold drink in a café in a neoclassic square. And certainly to shop and enjoy a busy nightlife. Ano Syros: Located in one of the highest hillside areas of Ermoupoli, clustered around the base of the Catholic Cathedral, is one of the oldest parts of town still standing, dating back to the 1200’s. Here is where islanders in earlier centuries lived, hidden up in the hills away from pirates. Based around the large Catholic Cathedral of St. George, this is a walled area of walking streets and little alleys, with whitewashed buildings in the Cycladic style. Ano Syros is reached either by climbing almost 900 steps from the harbor area or by road to a car park in front of one of the few remaining gates opening into the alleyways. 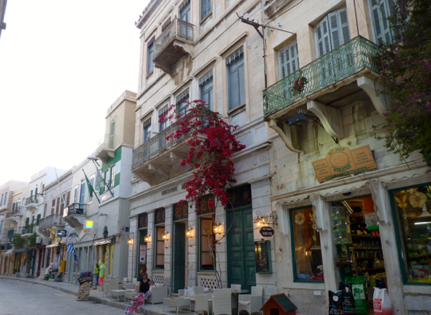 It is within this older area of town that the Bouzouki Master Markos Vamvakaris was born, and bouzouki music remains very popular here still today. Settle into a taverna in Ano Syros where bouzouki music may be playing in the background and sample the local “fire water” of Syros Island that may be poured out of a large keg in the rafters. Agios Nikolaos: The large Greek-Orthodox Church in Ermoupoli, built when the wealth of native born Sea Captain’s was flowing through the island, is filled inside with silver and gold, with an opulence reflective of the time when built. 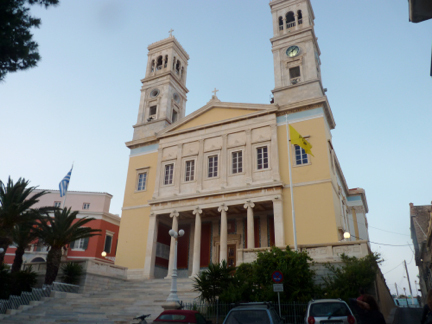 Agios Georgios Cathedral: Built in Ano Syros in the 19th century, as a one aisle church, after several disasters, the church was rebuilt in the 20th century as a 3 aisle basilica. The church is worth visiting if in Ano Syros during the day. The view of the harbor below from this church is spectacular. Beaches: The most popular beaches in Syros are located on the southern side of the island and are both sandy and pebbled depending on the beach. But they all have crystal clear beautiful water. 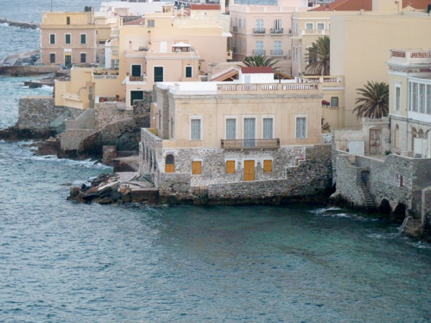 The best Syros beaches are Galissas, Megas Gialos, Kini and Poseidonia. Visit the religiously tolerant island of Syros, unique with both strong Greek Orthodox worshipers, and Catholic worshipers. Enjoy the night life in both the neoclassic harbor town, and the old Chora up in the hills when visiting on a crewed yacht charter.